Sleaford Town face another early alarm call as they begin their latest United Counties League campaign this weekend a week ahead of the official league start. Town kick off their season at home to Deeping Rangers on Saturday evening (ko 7.45pm), one in a package of seven matches over three days for Groundhop Weekend. When manager Jamie Shaw took his side to Holbeach in the corresponding weekend 12 months ago, he was just weeks into the job and at the start of rebuilding a decimated squad. But the club has swapped the turbulence of last year’s pre-season for stability and consolidation. Forwards Nathan Rivett and Cameron Heap, a former Boston United youngster, are among several new faces, while centre-half Charlie Ward joins from Lincoln United, central midfielder Joe Smith comes in from Holbeach, and left-sided player Calum Stewart from Lincoln City’s Under 18s side. “Last pre-season was pretty fraught and we hardly had any players to start the season,” Shaw said. “But we are in a better position this year so it should be more comfortable. “I’m reasonably happy with the squad, but as a manager you always want more. “We got ourselves into a decent position towards the end of last season, but I still felt we lacked a bit of depth in the squad. The close season has not been completely free of hiccups, however, with Town, like many teams, suffering postponements to key pre-season fixtures owing to dangerous pitches, baked hard by the long dry spell, and the distraction of the World Cup. 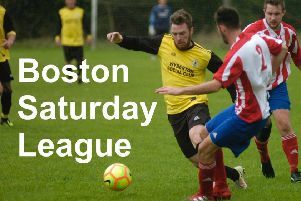 It had restricted Town to just one ‘full-strength’ match, nine days ahead of kick-off, a 3-1 defeat to Newark Flowserve. But despite the lack of game time, Shaw is adamant there will be no repeat of the relegation struggle which haunted the club throughout last season on their way to an 18th-place finish. Shaw also shares the belief of new chairman Kevin Newman that the club should be a bigger part of the town and attracting larger gates. And much of that will depend on results. “My aims are minimum top-half,” Shaw added. “It won’t be easy because there are teams in the league with crazy budgets, but there’s no reason why we shouldn’t aim to be a top-half side.